Want to ace the ASVAB? 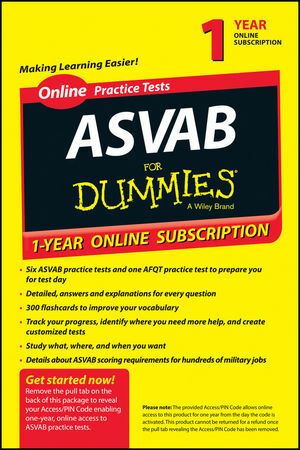 Your one-year, online subscription to ASVAB For Dummies offers seven test-taking opportunities to help you hone your skills and build your confidence. You'll have access to one AFQT practice test and six full-length ASVAB practice tests covering all nine test subjects. Rod Powers (Daytona Beach, FL) is a recognized expert in all U.S. military matters. Powers is a retired Air Force First Sergeant, and military author. His informative articles about joining the military have appeared in numerous military and civilian publications. He also serves as a U.S. military guide for About.com and is the author of the previous editions of ASVAB For Dummies and AFQT For Dummies. His page receives approximately 1.5 million page-views per week.